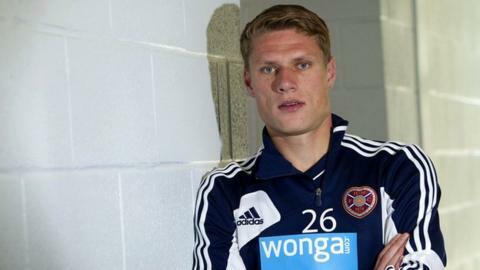 Hearts captain Marius Zaliukas will not play again this season following an ankle injury. The 29-year-old defender requires surgery after he was hurt during a collision with Johnny Russell in Saturday's defeat at Dundee United. The operation is scheduled for Thursday, with a 12-week recovery period predicted. "It's a blow for the player and the club," manager John McGlynn told the Hearts' website. "Marius has been a key member of the team." The Lithuanian international arrived at Tynecastle in 2006, initially on loan from FBK Kaunas, and was given the skipper's duties at the start of the 2010/11 season, despite stalling over a permanent contract. In November 2010, he agreed a deal that will expire this summer. Discussing the injury on Tuesday, McGlynn explained: "He's torn a ligament completely and another is hanging by a thread." Meanwhile, Hearts insist they are not under any threat from Ukio Bankas entering temporary administration. The Lithuanian bank is controlled by Tynecastle owner Vladimir Romanov. Hearts director Sergejus Fedotovas said via a statement: "The board wishes to make it clear that Heart of Midlothian plc and Ukio Bankas are two separate companies. "Hearts is majority owned by Ukio Banko Investicine Grupe (UBIG), a multi-national business conglomerate. UBIG is an entirely separate entity and stands alone from Ukio Bankas. "At a service and operational level, Ukio Bankas does provide the club with some banking services and debt facility and the board is liaising with Ukio Bankas on these matters. "The supporters of Hearts can be assured that the board of the club continues to be diligent in financial matters and we believe that today's events in Lithuania will have very little affect on our day-to-day business." Hearts' 2012 accounts show that it owes UBIG £24m and the club has faced two separate bills from Her Majesty's Revenue and Customs in recent months. They had to appeal to their supporters for help late last year when the tax authorities issued them with a winding-up order over an unpaid £1.75m sum. A share issue brought in £1.79m as fans rallied to the cause, while the club struck a deal with HMRC that will see £1.5m repaid over three years. The club also paid a separate £450,000 bill to the tax authorities just before Christmas. But financial concerns remain with an expected £2m shortfall in turnover that has already affected payment of wages and bonuses to players, leading the SPL to issue Hearts with a series of transfer restrictions.